Mufti Abdur-Rahman ibn Yusuf Mangera has been studying the traditional Islamic sciences and writing scholarly works for most of his life. He completed the bulk of his studies at Darul Uloom Bury, North England, where he memorized the Qur’an by age fifteen and thereafter went on to complete a rigorous, six-year Shari‘a program. He graduated from this program with authentic certifications (ijaza) in numerous Islamic disciplines, including Arabic, Islamic jurisprudence, and hadith (with particular emphasis on the six authentic books of hadith (Sihah Sitta) and the Muwattas of Imam Malik and Imam Muhammad). His teachers at Darul Uloom Bury included Shaykh Yusuf Motala and other students of Shaykh al-Hadith Mawlana Muhammad Zakariyya Kandhlawi (may Allah have mercy on him). He then traveled to Syria, where he received a second certification in Qur’anic recitation and memorization, this time from Shaykh ‘Abd al-Razzaq al-Halabi, who possessed a short, unbroken chain of transmission (sanad) to the Messenger of Allah in this subject. He also received a certification from Shaykh Adib Kallas (may Allah have mercy on him) after reading Mulla ‘Ali al-Qari’s Sharh al-Fiqh al-Akbar and attending lectures on other classical texts of Islamic creed (‘aqida). He spent the following year in Mazahir Uloom, Saharanpur, India, where he received formal authorization to issue legal rulings (fatawa), which required a close study of part or all of a number of classical jurisprudential texts, including, among others, Ibn Nujaym’s Al-Ashbah wa ’l-Naza’ir and ‘Allama Haskafi’s Al-Durr al-Mukhtar (along with its commentary, Radd al-Muhtar, by ‘Allama Ibn ‘Abidin al-Shami). During this time, Mufti Abdur-Rahman also attended classes on the principles of hadith (usul al-hadith), studying ‘Allama Lakhnawi’s Al-Raf‘ wa ’l-Takmil fi ’l-Jarh wa ’l-Ta’dil and parts of Imam Suyuti’s Tadrib al-Rawi. 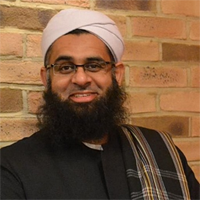 To date, Mufti Abdur-Rahman has written (1) Fiqh al-Imam: Key Proofs in Hanafi Fiqh (1996), (2) Provisions for the Seekers (2005), a translation and commentary of the Arabic work Zad al-Talibin, a small collection of short hadiths compiled by Mawlana ‘Ashiq Ilahi from ‘Allama Tabrizi’s Mishkat al-Masabih, (3) Prayers for Forgiveness: Seeking Spiritual Enlightenment through Sincere Supplication (2004), a translation of Al-Istighfarat al-Munqidha min al-Nar, a collection of seventy prayers for forgiveness transmitted from Hasan al-Basri, (4) Imam Abu Hanifa’s Al-Fiqh al-Akbar Explained (2007), a translation of Al-Fiqh al-Akbar along with Abu ’l-Muntaha al-Maghnisawi’s commentary and selections from ‘Ali al-Qari’s commentary, including Abu Hanifa’s Kitab al-Wasiyya, (5) Salat & Salam: In Praise of Allah’s Most Beloved (2007), a manual of blessings and peace upon the Prophet Muhammad , (6) co-authored Reflections of Pearls (2005), and edited Imam Ghazali’s Beginning of Guidance (Bidayat al-Hidaya) (2010). After years of listening to Mufti Abdur-Rahman and being impressed by his extensive insight, I finally got the opportunity to study something under him from overseas. I was taken aback by the depth and insight provided on the Hanafis which isn’t available at all in English and I desire that he continue teaching online so many seekers continue to benefit from his knowledge worldwide. It has been an honor and blessing to study under Mufti Abdurrahman ibn Yusuf who has a wealth of knowledge. Mufti Abdur-Rahman’s method of delivery is very good! Shaykh Abdur Rahman`s teaching style is easy to understand and he explains very well, more scholars like him are needed and I would recommend all to study under the shaykh. Mufti Abdur-Rahman is an eloquent speaker. He clarifies many controversial issues like slavery, status of women, polygamy, sufism etc. and leaves no doubts in the minds of his students. In his class, I noticed that he welcomed such sensitive questions and responded with patience and discussed the issue rather than simply telling us to accept because it says so in Quran and Hadith. Through his vast knowledge, he has the ability to take Islam out of the prison the modern society has made it out to be; and liberate the truth inside this beautiful religion. Alhamdulillah, this (Sweet Dreams course) was a very enlightening course about the spiritual impact of dreams. It was a very unique class, and it was taught in a very compelling manner by Mufti Abdur-Rahman. I learned a great deal about a topic that is not often studied in the Islamic sciences. I have gained a lot of knowledge from my teacher. May Allah give him a long life so I and others can carry on gaining knowledge. These courses online are great and really good boost of revision for those of us who studied before, lessons are very detailed shows all the research Mufti Abdur-Rahman has done. I hope to attend more and more courses! … as a result of his abilities and knowledge, I have seen a great increase in my understanding of the din, as well as a clearer perspective on issues. Mufti Abdur-Rahman’s teaching style is one that makes you think critically and one that forces you to apply what you are learning.